Part 2 of a 4-part series in which a scientific researcher learns how science advocacy groups influence the legislative process. Read Part 1 about her experience at Hill Day here. 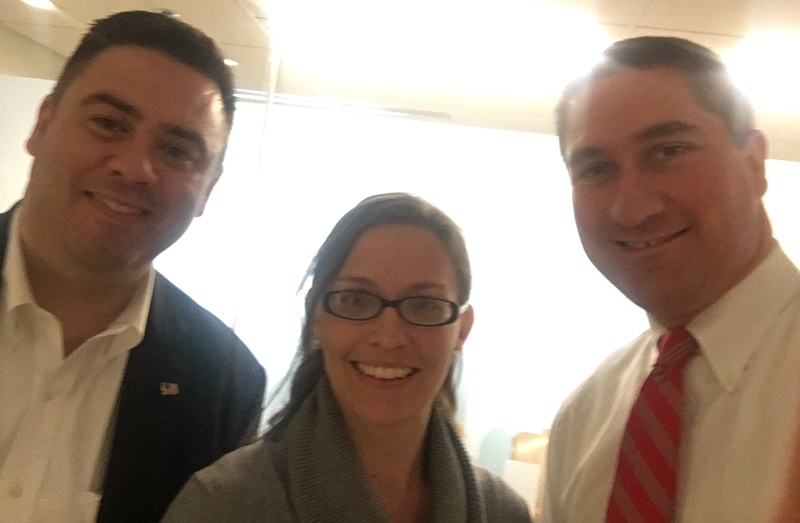 On March 22, 2016, as part of my Society for Neuroscience (SfN) Early Career Policy Ambassador outreach activities, I met with Matt Bailey, Executive Vice President, and Mike Dingell, Director of Public Policy, at the National Association for Biomedical Research (NABR). NABR is a nonprofit organization based in Washington, DC, that advocates for “sound public policy recognizing the vital role animals play in biomedical research.” I talked with Matt and Mike about the steps they take to see a piece of pro-science policy come to fruition. and Mike Dingell (R), Director of Public Policy at NABR. The most recent far-reaching example of NABR’s role in seeing pro-science policy enacted is the 2006 Animal Enterprise Terrorism Act (AETA), a federal law signed by President George W. Bush on November 27, 2006. This law prohibits any person from engaging in conduct “for the purpose of damaging or interfering with the operations of an animal enterprise.” Importantly, this statute covers any act that “damages or causes the loss of any real or personal property” or “places a person in reasonable fear” of injury. In essence, this law gives the U.S. Department of Justice (DOJ) the “necessary authority to apprehend, prosecute, and convict individuals committing animal enterprise terror” by broadening the definition of “animal enterprise” to include academic and commercial enterprises, and allows these enterprises to see restitution. In discussing the NABR’s role in legislation such as the AETA, I learned the basic steps the advocacy group takes in the life of a bill, and the places in which scientists (and citizens) can become involved. The life of a bill is also called the “sausage making process”, which is depicted in the diagram below. The “Lobbying Opportunity” symbol represents points in the process in which professional advocacy groups, like NABR, or individual citizens (that’s you, scientists! ), may become actively engaged and may work to influence the legislators’ decisions. Identify a problem that must be solved. In this case, animal rights activists were targeting researchers and their families/colleagues, and criminal penalties were needed to stop acts of intimidation, harassment and property damage. Scientists are key in communicating their needs to advocacy groups. Meet with stakeholders, like the DOJ, to identify the necessary tools to be effective. In this case, increasing penalties for criminal activity and the ability to pursue tertiary (or third-party) targeting practices (e.g., activists’ targeting of family members, contractors, etc.) was critical. Often times, existing laws are revisited and revised. In this case, the Animal Enterprise Protection Act (AEPA) of 1992 already existed, which made it a federal crime to interfere with animal research facilities. Now, NABR was seeking to protect individual researchers, as well as family members and others connected with them. Scientists may be consulted to make necessary changes to the new language, especially with respect to regulatory issues. NABR staff, Members of Congress and/or Hill staffers draft the document and bring it to legislative counsel to put it in the correct language. NABR finds the staffers who are charged with the relevant issues to work with first, then takes the legislation up additional levels as necessary. NABR researches which members of Congress to bring the bill to depending on the issue, which is where Congressional Committees come into play. Scientists can urge their representatives to join committees relevant to science policy, like the Subcommittee on Labor, Health and Human Services, Education, and Related Agencies (the “Labor-H” committee, in both the House of Representatives and the Senate) or the Health, Education, Labor & Pensions Committee (the “HELP” committee in Senate; House equivalent is Energy and Commerce Committee). NABR identifies Congressional members to introduce/sponsor the bill. Their goal is to get as many cosponsors as possible. “Sponsors are like the horsepower for a bill… they make it go” said Mike Dingell. In this case, the AETA was introduced by Jim Inhofe (R-OK), Sen. Diane Feinstein (D-CA) and by Rep. Tom Petri (R-WI). The bill is taken to House and Senate Subcommittees; if it passes there it moves onto a full Committee; if it passes there it moves to the floor for a vote. The bill must pass through both Houses of Congress before moving on for final approval. Scientists can put pressure on their Representatives and Senators to vote for the bill at each of these steps. The squeaky wheel gets the grease! Matt and Mike also told me the more general ways that scientists can help the cause: get involved! Pick up the phone (“One of the most annoying things is a phone that won’t stop ringing,” said Mike Dingell). Send emails. Meet with your representative, go to town hall meetings. Invite representatives for lab tours. Matt said NABR could not have accomplished the AETA without these particular actions by thousands of scientists. Other ways to effectively engage are to write letters to the editor of your local newspaper and become active on social media: comment on science articles you see on Facebook or Twitter, support organizations online (“It’s called a social network for a reason.” – another gold nugget by Mike Dingell), tweet at your representative to support science. Finally, think about getting into the classroom: conducting outreach to the next generation of voters and lawmakers is critical for the future of scientific research. The views and opinions here are solely those of the author and do not reflect the NIH. Parts 3 and 4 of this series will focus on Dr. Dettmer’s interview with her representative about enacting pro-science policy, and the merging of parts 2 and 3 into a comprehensive guide for scientists in becoming involved in the process. Stay tuned! Posted on April 4, 2016 by EditorPosted in News, Outreach NewsTagged Dettmer, NABR, policy. Previous Previous post: Interview: How our outreach experiences have changed! Next Next post: How have animals helped scientists fight diseases?